Despite the wintery weather we are having this morning, we assure you that spring is on its way. 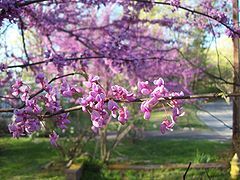 In the hopes of bringing in warmer weather, blooming trees, and budding flowers, we are making this week’s plant of the week the Redbud. Redbuds are one of our favorite blooming trees here at Kane Landscapes. Redbuds make fine lawn trees, look great in groupings, and have their place in shrub borders and even foundation plantings. What makes redbuds unique is that they are the only flowering tree that re-bloom on old wood year after year. They generally have a short, often twisted trunk, spreading branches, and grow to be about 20-30 feet tall. Despite their name, the flowers on redbuds are a lovely lavender or purple hue and appear in clusters from Spring to early Summer on bare stems, before the leaves appear. Blossoms are followed by clusters of flat, beanlike pods that persist into winter and give rise to numerous seedlings around the tree. Handsome, broad, rounded or heart-shaped leaves may change to bright yellow in fall, but fall color is inconsistent.